Kerala is a region of India, musically known for Sopanam. Sopanam is religious in nature, and developed through singing invocatory songs at the Kalam of Kali, and later inside temples. Some famous singers are Neralattu Rama Poduval, Janardhanan Nedungadi and Damodara Marar. Sopanam is a form of Indian classical music developed in the temples of Kerala in the wake of the increasing popularity of the Jayadeva's 'Gita Govinda' or 'Ashtapathi'. Sopanasangitham is sung by the side of the steps (Sopanam) of Temple, with the accompaniment of the drum called 'Idakka'. The sopanasangitam in its traditional form is seen at its best among the Marars and Poduvals, who were hereditary Ambalavasi Ardha Brahmanas (Semi Brahmins) engaged to do the same. Kerala has shared the general musical culture of peninsular India from the earliest times. South Indian music is generally known as Carnatic music because of its common features. Each region of the south has its own culture. Kerala's music is known as Sopanam. Sangeetam (Music) appears to have acquired its name from the 'Sopanam' which means 'Sanctum Sanctorum' of the temple. Its essential features were born out of a happy blending of the Vedic, the folk and tribal music of the region. Pandi Melam is a classic performance (melam) of different musical instruments that are unique to Kerala state of south India. The most traditional of all melam's is 'Pandi Melam' which is generally performed outside the temples. Another melam called Panchari melam, which is similar to Pandi melam is played when you are inside the temple. Panchavadyam As Panchavadyam is regarded as one of the most sophisticated art forms in Kerala, the performers are highly respected and usually a huge crowd gathers to watch and listen to the performance. In distinction to the smaller ritualistic panchavadyam, this orchestral form is also called sevanga panchavadyam. Similar to chenda melam, panchavadyam is also characterised by a pyramid rhythmic structure, the ever increasing tempo, and the proportionally decreasing number of beats in a cycles. In contrast to melam it uses different instruments, is not related so closely to the kshetram ritual, contains improvised parts, and its present form was only composed in the 1930s by the maddalam artist Venkichan Swami Bhagavatar and Madhava Warrier. An intelligent mixture of composed and improvised parts creates an amazing sound atmosphere. Similar to panchari the artists are grouped in two semicircles facing each other. According to the panchavadyam band leader and timila artist Kuttapan Marar (2001), this genre is not performed for any ritual, though it is performed in a small ensemble parallel to the diparadhana evening ritual. Tayambaka Tayambaka is a solo chenda performance, supported by other itantala (treble) and valanthala (bass) chenda and ilatalam cymbals. Apart from playing improvisational and compositional elements the solo artist leads the other players, who have to support him in every respect. The constant changing speed makes this task very difficult for the accompanists. Like panchavadyam this genre is widely performed outside the temples. In a kshetram ritual context tayambaka is performed at the annual festivals during the diparadhana sunset ritual, after the deity is brought out of the inner shrine. The performance, lasting between 60 and 90 minutes, is regarded as an offering to the goddess. The tayambaka connoisseurs are assembled around the ensemble and watch every movement of the chenda players with critical distance. Panchari Melam The percussion ensemble panchari melam (or panchari), as part of the chenda melam (or melam) family, is the best-known and most popular kshetram vadyam genre to be performed at virtually every temple festival in central Kerala. Malayalees, especially in the central districts, regard panchari as the most ancient percussion genre in Kerala. Other melams are pandi, chempata, anchatanta, dhruvam, atanta, and chempha. Though there are musical and ritualistic differences between the panchari and other melams, the description of the former is proto-typical for the latter. Panchari melam is either performed in an elaborated form (bigger ensemble, longer performance time) to accompany the annual temple festivals or in an abbreviated form for the daily or weekly rituals. Both forms are performed within the walls of the temple. The ensemble starts at the main entrance to the inner part of the temple, slowly circumambulating the shrine clockwise while playing. On either of the eight wind directions or the compass points they stop and perform. Usually a phase or at least a talavattam (tala cycle, see below) is concluded before proceeding; thus paying reference to each divinity located in different parts of the temple. The procession is led by the divine idol of the temple kept on an elephant or carried by a Nambutiri priest. The deity faces the musical ensemble and devotees, the latter surrounding the musicians in a semi-circle eagerly following the musical progress of the melam. 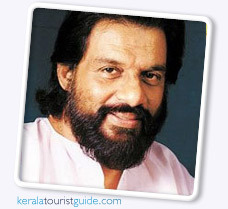 Dr. K. J. Yesudas is an eminent Indian classical musician and leading playback singer of film songs in many Indian languages. He was trained by the Chembai Vaidyanatha Bhagavatar who was one of the senior most performers of the time in Classical Music, and this training, abruptly cut short by the guru's demise in 1974, still stood him in good stead. Although a Carnatic expert he also learned Hindustani Music. He combines Hindustani Music and Carnatic Music style in all their varieties and did not want to tie himself down to Carnatic music. His voice lends itself well to both Indian classical, devotional and popular songs. He has recorded more than 40,000 songs for many languages including Hindi, Tamil, Kannada, Telugu, Bengali, Malayalam, Gujarati, Oriya, Marathi, Punjabi, Sanskrit, Tulu, Russian, Arabic, Latin and English through his long career.